Not logging out can be a huge privacy risk, especially on public computers but also on other computer systems that multiple users have access to. Why is that? Because everyone accessing the computer after you may access your user profile on Internet websites that you did not log out on. 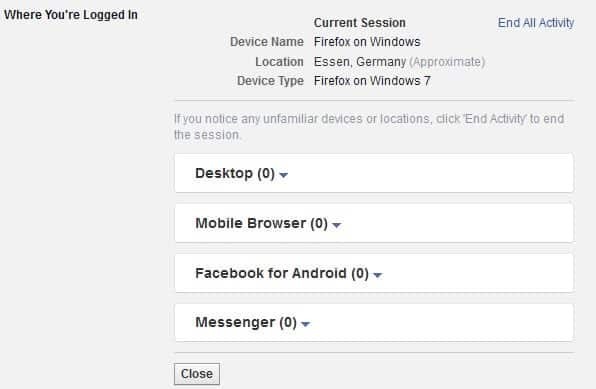 That was reason enough for Facebook to add a new option under the Account Security section that displays all devices and computers you are logged in. The information provided help you discover systems that you are not logged out properly, and since you can end activity on those remote systems, it even improves security significantly in those cases. Probably more interesting than the option to end the activity of those user sessions is the fact that they are displayed on the page. This means that Facebook users who suspect that someone else may have access to the account have now the option to find out in Account Activity as well. That's on top of the Facebook login notification feature that informs you by email or SMS if another device or computer is used to log into the account. Click on the small down arrow icon located in the top right corner of the page and select settings from the context menu. Switch to Security on the left and click on "Where you're logged in" on the page that opens. Facebook in past months has shown a drive to improve the site's privacy settings and tools for its users. Find out how to log out of Facebook on remote computer systems that you have used in the past to sign in to the social networking site. That’s a interesting information. I did not notice. I was well informed about these issues. Thanks for your tips.